Times: Daily, in suitable weather conditions. Choose to fly either early morning or early evening. Duration: 4 hours. Flight time 1 hour. The balloon flights are operated by a professional ballooning company, staffed by competent pilots with years experience of ballooning in the Czech Republic and elsewhere in Europe. A total of 18 balloons in various sizes and colours are available. The basket size depends on the size of the balloon, each basket taking between 2 and 6 guests. So if you are booking for 2 or more people, the hot air balloon(s) is exclusive to you. This makes ballooning an ideal excursion for a romantic couple, but equally it can be a fun packed group activity for up to 50 people, flying in several balloons at the same time. During the trip you will enjoy incredible views over the countryside surrounding Prague, including either Karlstejn Castle or Konopiste Castle (the balloons cannot fly directly over Prague due to restrictions on the airspace). Ballooning offers you the chance to experience the beauty of flight without the sound of engines, in the open air. Balloon flights operate all year, but as safety is paramount they only run when the weather is suitable. To ensure the best chance of making your flight, enter a range of possible dates on the booking form. Bookings are then subject to a final confirmation 24 hours prior to the flight time. Full details will be sent to you on receipt of your enquiry. 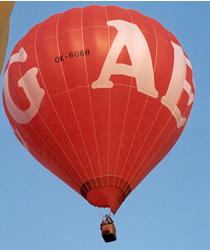 Payment will only be taken after a balloon flight has taken place; if there is no flight, there is no charge. Please pay in cash. Passenger insurance is included in the price of the trip. Children 12-15 years of age must be accompanied by an adult. The departure point is outside Prague, and the flight time is around one hour. A taxi can be arranged to pick you up from your hotel, to take you to the launch site. The return price is 500 CZK per taxi. The temperature in the hot air balloon is roughly the same as on the ground, so no extra clothing is required. Casual clothes and shoes are recommended. -Private balloon flight of around 1 hour.